Fujifilm has announced today two new GF lenses built for use with their new GFX line: the Fujinon GF 110mm f/2 mid-telephoto and the Fujinon GF 23mm f/4 wide-angle. Both are compatible with Fuji’s new flagship medium format outing, the Fuji GFX-50S, which caused quite a stir when it was announced at Photokina late last year. First up, aimed at portrait photographers, is the Fujinon GF 110mm f/2 R LM WR. It’s a medium telephoto lens with a focal length equivalent to 87mm in 35mm-terms, featuring an aperture of f/2 at its widest – which should make the most the medium format GFX-50S and lead to some very pleasing bokeh effects when shooting wide open. On the inside, the GF 110mm f/2 features 14 lens elements arranged in 9 groups, including 4 extra-low dispersion (ED) elements, which should go some ways to removing any unwanted spherical and chromatic aberrations. It features a linear motor to power the autofocus system, for fast and quiet shooting. On the outside, it’s inherited the dust- and weather-proofing of its slightly older XF lens series cousins, for when shooting in adverse conditions. According to Fuji, it’ll operate in environments down to -10°C. Brand new, though, is a ‘C’ position – C for ‘Command Dial mode’ – on the aperture ring, for photographers who prefer to control aperture from the main camera body, rather than the lens itself. There’s also a new locking mechanism on the lens for the Auto and Command Dial modes to stop accidental movements of the dial. 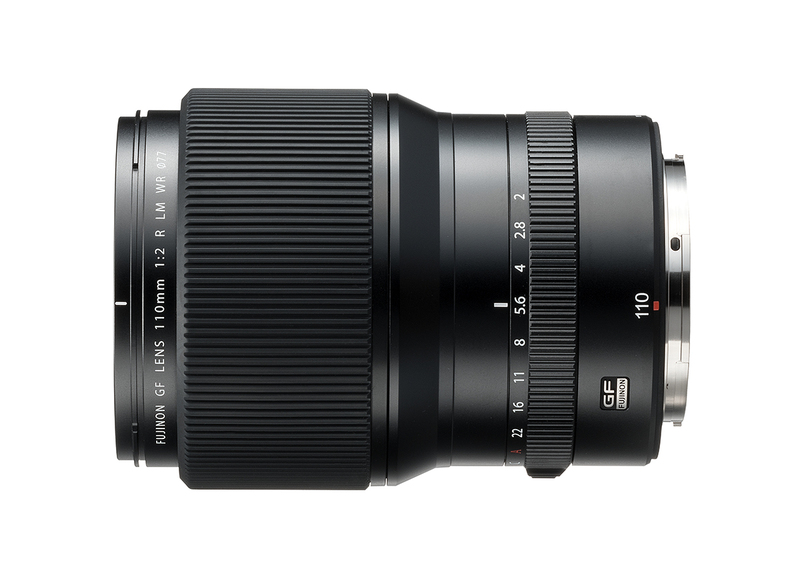 The GF 110mm f/2 R LM WR should be hitting UK shores in June, with a pricetag of £2,599. Meanwhile, the Fujinon GF 23mm f/4 R LM WR is a super-wide angle model with a equivalent focal length of 18mm in 35mm-format terms that should prove popular with landscape and architecture photographers. It features a 12 group/15 element construction, with two aspherical lenses, one ‘super’ ED lens, and three regular ED lenses, which ought to suppress distortion and aberrations for high resolution performance all the way to the edge, despite the 23mm’s large, 99.9° angle of view. The glass also features a Nano GI coating, which is designed to handle the reflections of light entering the lens from diagonal angles, thanks to the lens’ wide angle nature – which should help to keep and ghosting or flare effects to a minimum. We’ve seen this before on some of Fuji’s XF-series lenses. It also uses a linear motor for improved autofocus performance. Like its sibling, the 23mm features dust- and weather-proofing and will operate down to -10ºC. It also features the same Command Dial mode option on the aperture ring, and the auto-locking system to prevent accidental aperture changes. 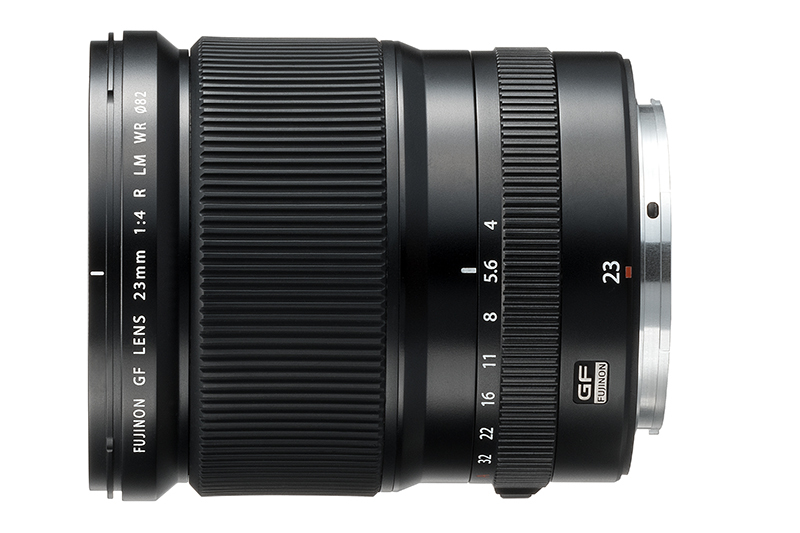 The Fujinon GF 23mm f/4 R LM WR will also be available this June, at a suggested price of £2,399. Besides the above two lenses and the GF 45mm f/2.8 R WR, Fuji has already revealed that more lenses are to join the line-up at some point next year – a telephoto prime and tele-converter. To see what we think of Fujifilm’s first medium format camera, check out our hands-on first look of the Fujifilm GFX-50S. The EC-GFX eyecup for the GFX-50S with a light shield and comfortable soft build, making it easier for users to see the viewfinder in strong light. Price TBC. 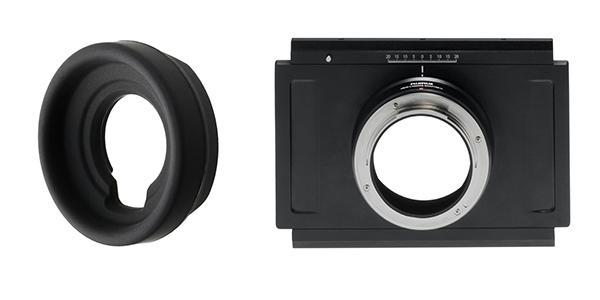 The View Camera Adapter G, to be used when shooting with the GFX 50S and using older Fujinon large format camera lenses, such as the CM Fujinon, for example. Price TBC.